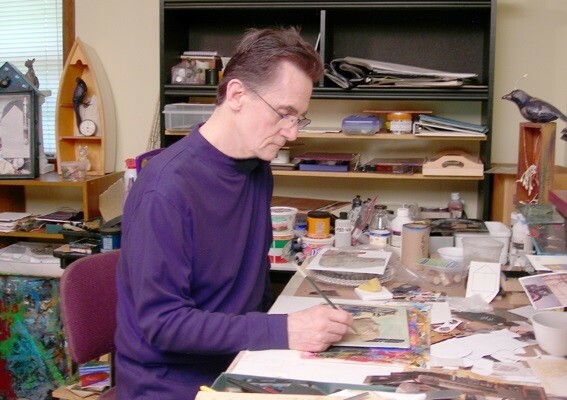 Dennis Salaty earned an MFA degree from Northwestern University in Art Theory and Practice, and a BA degree in Fine Art from Columbia College. He was apprenticed to sculptor Jack Kearney at the Contemporary Art Workshop where he constructed welded steel sculptures and worked in the lost wax process with bronze cast sculptures. Additionally, Dennis studied painting and drawing under George Cohen, Ed Paschke and Phyllis Bramson. Dennis currently works in mixed media acrylic and assemblage. His meticulously constructed collages evoke a sense of mythological past that intersects with our world only in our dimly lit subconscious. These sometime jarring compositions are created by marrying dissimilar yet complementary images. Dennis has taken part in many exhibitions including at the Woodwalk Gallery (WI), Elmhurst Art Museum (IL), Bloomington Art Museum (IL), Norris Gallery (IL), and Triton Fine Art Gallery (IL), and his art has won numerous awards.